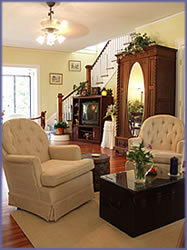 Inn Shepard’s Park, a South Florida bed and breakfast is conveniently located near Palm Beach, Vero Beach and Ft. Pierce. This Key West style Stuart, Florida hotel alternative is nestled in the Heart of The River Front Village. 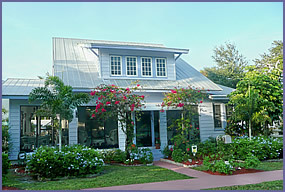 Historic downtown Stuart shops, restaurants and entertainment are within walking distance. 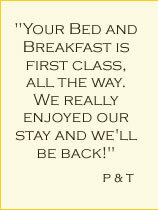 Among our amenities are comfortable rooms that are quaint and beautifully appointed with cable TV and air conditioning. Relax in our Jacuzzi, lounge on our wrap-around porch and take in the view of Shepard's Park and Frazier Creek Beaches. 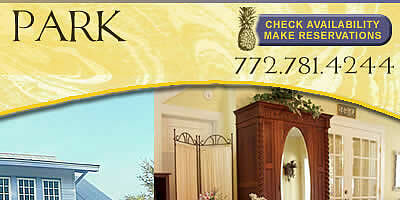 Whether it is a golf outing, a weekend getaway, a wedding or other special occasion, a Hutchinson Island beach vacation, a retreat, a shopping spree in downtown historic Stuart, fishing or boating on the St. Lucie River from Northside, River Watch, or Finest Kind Marinas, or a romantic River Walk; let us host your stay at our Florida B&B, your Home Away From Home.